Prime Minister Tuilaepa Sailele Malielegaoi with Cabinet Ministers and members of the Baha’i Faith at the celebration of their 60th Anniversary, 14 January 2014. 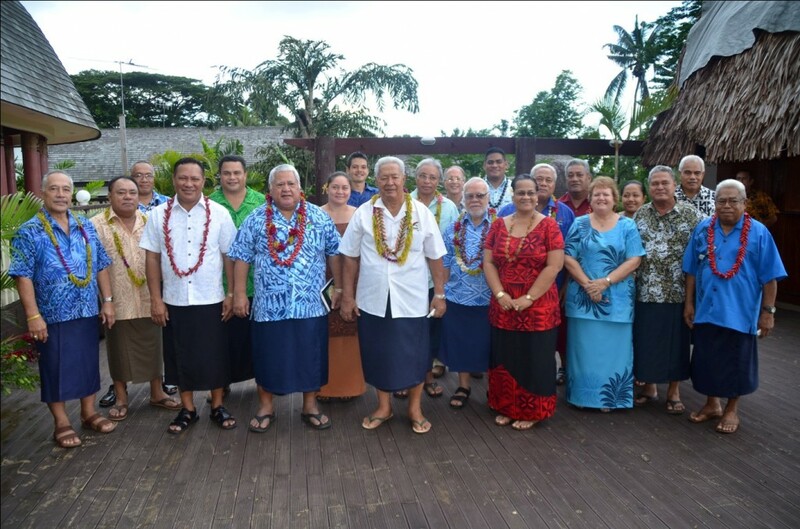 APIA, Samoa (March 1, 2014) — The Prime Minister of Samoa has expressed his gratitude to the country’s Baha’i community for its long service to the development of Samoan society. The Honorable Tuilaepa Sailele Malielegaoi made his remarks during celebrations marking the 60th anniversary of the establishment of the Baha’i Faith in the Pacific island nation. “I take this opportunity to express the appreciation of the government for the important contribution that you make to the spiritual life of our country,” he said. The Prime Minister noted that the work of the Baha’i community, along with all churches in Samoa, is paramount in bringing out the best in people. A number of Cabinet Ministers joined the Prime Minister and representatives of the Baha’i community at a special observance, held at the Samoa Tradition Resort on Tuesday 14 January, 2014. He additionally assured those gathered that the Samoan Government strives to protect the right of all to worship. The Baha’i Faith was first established in Samoa in 1954 with the arrival there of a Swiss-Australian woman, Lilian Wyss. The Samoan Head of State from 1962-2007, His Highness Susuga Malietoa Tanumafili II, became the first reigning sovereign to accept the Baha’i Faith. He dedicated the Baha’i House of Worship in Tiapapata in 1984. A special commemorative service was held there on 12 January for Baha’is and their friends to celebrate, reflect and review milestones in their community’s development. A member of the National Spiritual Assembly of the Baha’is of Samoa, Peseta Demetrius Fogaseuga Taofiga, said the events offered an occasion to reflect on the challenges and accomplishments of the past six decades. “It is also an opportunity to consult on ways and means to build better communities, and to continue serving Samoa and its people,” he said. The greatness of a nation is not determined by the measure of its size or military strength but by the condition of the souls of its people.